IOS Boxing Promotions today announced its complete fight card for the much-awaited fight night ‘Battleground Asia’ scheduled to happen at Dome@NSCI, SVP Stadium in Mumbai on 5th August 2017. 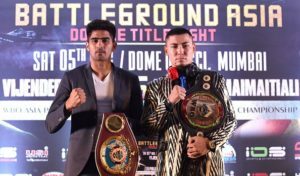 The knockout king Vijender Singh headlines a quality packed card that also features debut of Beijing Olympic quarterfinalists Akhil Kumar and Jitender Kumar. In the double title fight, Indian boxing sensation Vijender Singh will take on Chinese No.1 boxer Zulpikar Maimaitiali and both will compete for double title – WBO Asia Pacific Super Middleweight & WBO Oriental Super Middleweight. The other two key boxers Akhil Kumar (Junior Welterweight – 63.5 Kg) will take on Australian TY Gilchrist and Jitender Kumar (Lightweight – 61.2 Kgs) will face Thanet Likhitkamporn from Thailand in their debut fights. 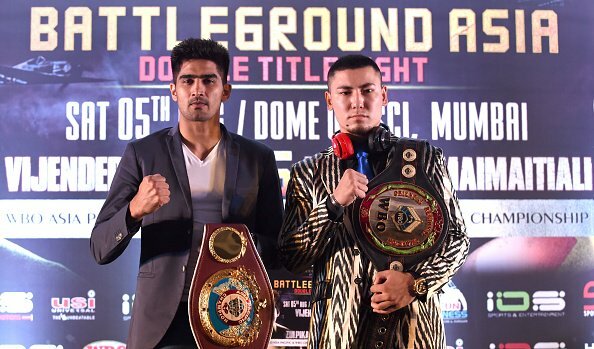 ‘Battleground Asia’ will also see participation from other boxers apart from the Beijing Olympic trio, WBC Asia Welterweight Champion Neeraj Goyat who will be looking to defend his title belt, the other joining the fight card are Pardeep Kharera, Dharmender Grewal and Kuldeep Dhanda. The 26-year-old boxer from Haryana, Neeraj Goyat made his professional debut in 2011 against Gou Wen Dong in China. He has fought 12 bouts with an experience of 71 rounds under his belt and claimed 8 wins, with 2 Knockouts. The Indian is currently placed 35th in the WBC list which was updated after his victory over Australian Ben Kite, who he defeated to retain his title. In 2016, he had won bronze medal in the AIBA Pro Boxing Olympic qualifier. WBC Asia Welterweight Champion Neeraj Goyat will be looking to defend his title in a 10-round fight against Allan Tanada of Philippines in the Welterweight category (66.7 Kgs). Neeraj will be facing a much-experienced boxer, Tanada who made his debut in the year 2008 and has played 24 bouts since then with winning 15 of them including 7 KO’s, and has 137 rounds under his belt. The 21- year old Pardeep Kharera comes from a small district in Haryana. Pardeep turned pro last year in February, till date he has 3 bouts with 11 rounds under his belt. Pardeep, will face Wanphichit Siriphana of Thailand who debuted in the year 2014 and has fought 3 bouts since then. Siriphana has played 15 rounds, he has won 2 bouts out of the 3 that he has been a part of. Pardeep will face him in a 6-round contest in Welterweight category (66.7 Kgs). Dharmender Grewal turned towards professional boxing in April last year and has fought and won 2 bouts since his debut, with one resulting in a Knockout win. He will face Isaac Slade of Australia in a 6-round contest, in the Cruiserweight category (90.7 Kgs). Isaac debuted in the year 2015 and has been a part of 3 fights with 15 rounds. However, he has won only 1 bout with KO, the other two resulting in loss and draw respectively.